Aikatsu! – 79 | Mezashite! You know all that character development, relationship building, and cast interactions that’ve been going on for the last 78 episodes? Well, they’re still important. Also, I declare as of this episode that Seira and DreAca have been completely redeemed from the injustice Sunrise did them in the first half. 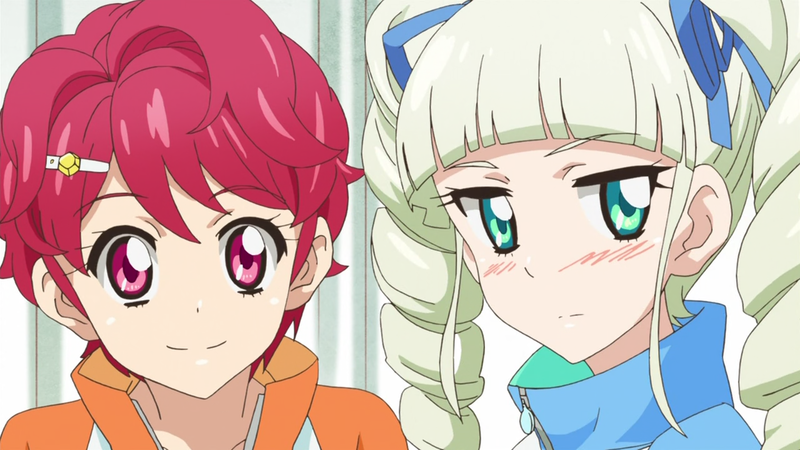 And leave your Yurika goggles at home, you won’t be needing them (though these two certainly will). Yurika is such a tsundere. I support any ship with Yurika, on the grounds that at least one half of the pairing contains Yurika. I didn’t have much Yurika lately so really happy with this episode. YAY, thanks for the real ease. and now, to download the week episode! That’s the very first episode without actual idol performance, isn’t it? It’s happened a few times before. The first ones to come to mind are the ones that involve drama/movie scenes (which have a song play in the background while they do the acting) and episode 50 (which had Calendar Girl play while Ichigo made her way to the airport). 50 had Ichigo vs Mizuki with Moonlight Destiny. Ones without performances were Off-time, Swallowtail, Ikenai Deka, Chocopop Tantei, and that last DreAca one where they all got parts different from their personalities. But actually, according to the anime, participate on dramas is also an idol activity. And Off-Time had Ichigo, Ran and Aoi performing on the beggining of the episode. So it’s really the first episode without a performance (singing or acting). Yes, that’s what I’m talking about. I don’t know if this is incorrect, but at about 7:20, should “Personal compatibility as important as anything else” be “Personal compatibility IS as important as anything else”? At 9:04 “pop cars” should be “pop cards”.